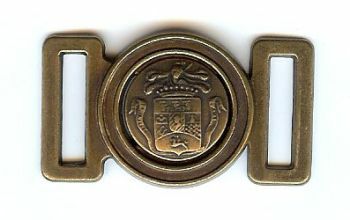 BC184 - Classic Coat of Arms Clasp/Buckle in Antique Brass Finish. 1.75" X 1". 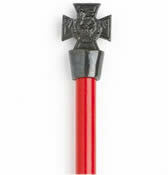 Also available in other metal finishes. Great for Civil War, Western, Regency, Colonial, Renaissance, Elizabethan, Cavalier, and Medieval cloak, sweater, jacket, coat, shirt or belt clasp. Cloak Clasps, Cape Clasps, Belt Buckles, Sweater Clasps. Two piece closures, 2 piece closures. Belt Buckles - small.